Small apertures are successfully used to extend depth of focus in presbyopic patients implemented either as corneal inlays or intraocular lenses. The use of small apertures reduces retinal illuminance. In this study, we quantify the relative perceived brightness in the 2 eyes of patients implanted monocularly with a small-aperture inlay. We used a binocular adaptive optics vision simulator to determine the relative perceived brightness. Four patients implanted monocularly with the KAMRA corneal inlay (1.6 mm) and a group of control subjects participated in the study. The projected pupil on the eye implanted with the inlay alternated in diameter between 0 and 2.5 mm (effective 1.6 mm) to eliminate potential for light to project around the periphery of the inlay while the corresponding fellow eye projected pupil alternated between 0 and 3.0 mm or 0 and 4.0 mm at a frequency of 1 Hz. Alternation on both eyes was synchronized so that only 1 eye at a time had a nonblocked pupil. At equal transmittance, a flickering was perceived. Patients’ task consisted of modifying the transmittance of the pupil corresponding to the fellow eye until the perceived flickering, owing to the different perceived brightness, was minimized. This equalizing transmittance (ET) value indicates the relative perceived brightness. In the KAMRA’s patients, ET was found to be greater than expected considering the difference in pupil sizes and the Stiles-Crawford effect, showing an enhanced a greater brightness perception in the eye with the small aperture in comparison with the fellow eye. Compared with the control subjects, this difference was on average bigger by a factor of ×1.42. 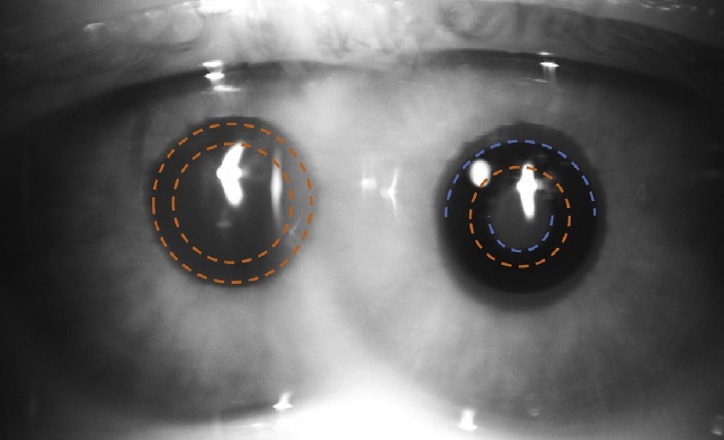 Patients implanted with the small-aperture corneal inlay exhibited an enhanced brightness perception with the eye implanted, in comparison with their untreated fellow eye. The amount of this increase is much larger than what could be expected owing to the Stiles-Crawford effect and was probably attributable to a neural adaptation process. This phenomenon could explain a reported equalization of brightness between eyes in patients with unilateral inlays and implies that the expected reduction of brightness may have a less significant impact on these patients, as expected.